Cascade Designs, Inc., the Seattle-based industry leader in the design and manufacture of premier outdoor equipment, today announced the distribution of the SealLine Urban Line of gear protection through QBP (Quality Bicycle Products). 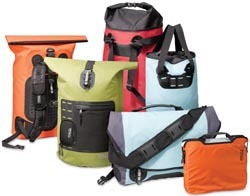 A leading distributor to the cycling industry, QBP will stock the full SealLine Urban Line including the Urban Shoulder Bag, Urban Backpack, Urban Tote, Computer Sleeve, Urban Backpack Organizer, Zip Pocket, Mobile Electronic Case and the new Water Bottle Pocket. Introduced to market in 2007, the PVC-free SealLine Urban Line is a collection of functional, smart-looking bags, packs and accessories designed to provide guaranteed protection for everyone from the performance-first bike messenger to the eco-minded commuter. The bags feature premium-quality welded seams that outperform the sewn seams most commonly found in urban bags. "The Urban Line has been popular with the independent bike dealer and their customers," said Erik Flink, SealLine Brand Manager. "So we're excited that the Urban Line will be more readily available to those shops through QBP." The SealLine Urban Line has been recognized with a 2007 Design Award in the Consumer Product category by I.D. Magazine and a 2007 Bronze Outdoor INDUSTRY AWARD by the International Design Forum in recognition of innovative and original design. Seattle-based Cascade Designs, Inc. is the market leader in all-purpose, portable gear protection products designed for use in challenging outdoor environments under the SealLine brand. SealLine brand bags, cases, packs, duffels and accessories provide gear protection for urban commutes, paddle sports and most any outdoor adventure. The majority of SealLine brand products are made in the Seattle, U.S.A. and Cork, Ireland manufacturing facilities. For more information, visit www.seallinegear.com. Based in Bloomington, MN, QBP is a leading distributor to the cycling industry. QBP offers domestic and international retailers a wide array of products and services including a 1,500-page catalog, a robust online ordering system, a renowned custom wheel service, a specialty bike-building program and more. QBP continues to be a vigorous advocate for the cycling industry. For more information, please contact Jo Wright, Director of Marketing at 952-941-9391, or visit: www.QBP.com.